Fantastic news! Home Depot jailbreak has been released by jk9357, a well-known jailbreak developer. 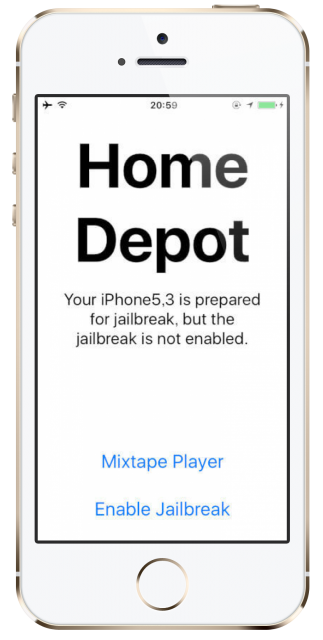 Home Depot is the latest jailbreak tool that works on all 32-bit devices. Included with the tool are Cydia, tfpo, Substrate framework, and “mixtape player”. There is no need to enter offsets manually either because this tool does it all for you. It does require Cydia Impactor and your Apple ID. Make sure you back your date up first using iTunes – if anything goes wrong, you will lose everything. Plug your iPhone/iPad/iPod Touch into your computer and wait; Cydia Impactor should recognize it. When the process has finished, your device resprings; the Cydia icon will be on your home screen and your device is now jailbroken. Because this is a semi-untethered jailbreak, whenever your device is rebooted, you must reactivate the jailbreak. Because you use your Apple ID, the certificate will expire – with a free ID, it’s every 7 days, 12 months with a paid developer ID. Home Depot jailbreak is a godsend to many iOS users so give it a go and tell us how you get on with it. Like what you read? Follow us on Facebook for more like this.